Heavenly Father, creator of a universe full of wonder and many still-hidden mysteries. Help us in our modern, sometimes confusing and fast changing world to pause and reflect on your glory and unending grace and in the stillness to listen, like Samuel, for your voice speaking to us alone. We bring to you now our prayers and concerns for others confident in the knowledge that our prayers will be both heard and answered. 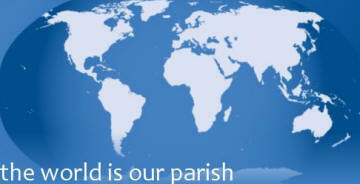 As we pray for the Church both far and near we remember the great commission to go and make disciples of all nations. Help us through our services, community outreaches, house groups and other organisations to be bold in our professing that Christ is Saviour and Lord of all. We pray especially for the Rt. Reverend Dr. Alan Smith the newly appointed Bishop of St, Albans that as he takes up his office at Easter he will know your presence along his new journey of faith. We pray for the ongoing discussions about Methodist Circuit mergers and the meeting at Priory tomorrow evening that ‘your will’ may be discerned in all things. We pray for all who share in the church’s mission in this community. Help us to move forward in faith trusting in the guidance of your Holy Spirit and in your divine purpose for us all. We continue to pray for peace in your world, and especially for those involved in the process of reconciliation and bridge building between peoples, cultures or nations. We give thanks for the cessation of hostilities in and around Gaza but pray for those for whom it has come too late. We pray for all innocent victims of violence both in the Middle East and in other war-torn parts of the world. Help us wherever and whenever we can in our everyday lives to be instruments of your peace. We are called to challenge injustice in all its forms and we pray for all aid agencies bringing hope to peoples in desperation and in situations that often seem hopeless. In our world of Have’s and Have-nots and as we come to terms with new economic realities help us to remember those who are without even the most basic of the necessities of life and for whom Christ also died. We pray for our own nation, for Elizabeth our Queen, her ministers and for all who serve the people at all levels of government and responsibility. The current and deepening financial crisis creates uncertainties and hardship at all levels of our society and we pray for careful and considered leadership that transcends party politics and works for the betterment of all sections of our diverse society. As we see the jobless total rise and the increase in the reality of house repossessions on our tv screens we pray for all charities who work to improve the lives of those blighted by misfortune and earnestly pray that our nation will still maintain its levels of giving. We pray for our armed forces overseas and their families back home and that their time ‘in theatres of conflict’ is brought to a timely conclusion. Help us all to play our part in creating and maintaining a just, equitable and loving society with Christ at the centre of our lives. Lord Jesus, we turn our thoughts and prayers to those who are in physical, mental or spiritual need. And let our prayers extend to those who faithfully and lovingly care for them in whatever location or capacity. We pray for those who reach out to those in need to help them to know that they are not forgotten. We bring before you now those known to us who are in any sort of need at this time. In a moment of silence we name them in our hearts and commit them to your loving care (silence). Let those for whom we pray feel your healing touch in their lives and that through your unfathomable grace they come to know your peace in their lives. The loss of a loved brings many questions, doubts and mixed emotions which are difficult to express and so we give you thanks Lord for the opportunities in the life of our church to offer support and comfort to those bereaved. a) As Philip and Nathanael were called to be your disciples so we too must be prepared to respond to whatever you ask of us knowing that in all things you will be at our side. AMEN. We sing the Lord’s Prayer together.